This site is devoted to MMIX and MMIXware. The following message from Donald Knuth gives a good introduction to MMIX. Welcome to all lovers of clean (or nearly clean) hardware design! After MMIXware, as described in Volume 1 Fascicle 1 of TAOCP, was finally frozen in September 2011, this site, hosted by the MMIX group at Munich University of Applied Sciences, coordinates the future development of MMIXware. We provide here a collection of materials for all those that work with MMIX, study MMIX, engage in the further development of MMIX, use MMIX, or just want to find out what MMIX is. 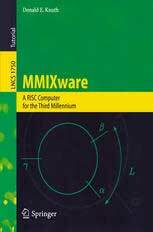 The new edition of MMIXware, A RISC Computer for the Third Millennium, Lecture Notes in Computer Science, Volume 1750, is now in print. It documents Version 1 of MMIX, and it corresponds to the programs of mmix-20131017.tgz. Version 1 is permanently frozen, and "bug-free by definition." Of course this does not preclude future developments. 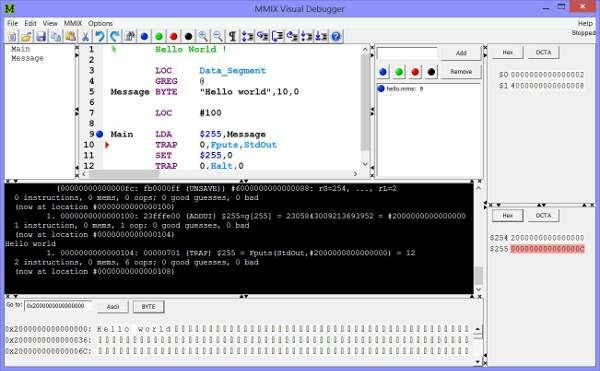 The new MMIX Visual Debugger version 1.1 has been released. For downloading the setup file and screen shots, see the MMIXVD page. For those new to MMIX, this is the place to start. One of the primary reasons for designing MMIX was to replace MIX in the previously published volumes 1, 2, and 3 of The Art of Computer Programming, by Donald E. Knuth, and to use it in every subsequent volume, starting with volume 4. Until updated editions of volumes 1 through 3 are available, The MMIX Supplement to the Art of Computer Programming includes MMIX versions of every MIX program in those volumes. These MMIX versions are also available for download here. The book itself, which includes substantial supplemental material on MMIX programming, (ISBN-13: 978-0133992311, ISBN-10: 0133992314) is available from Amazon or other bookstores. The documentation page provides a full set of MMIX related documentation - mostly in pdf format but also including some videos. The latest MMIX source files can be found on the sources page. NEW:The Sources of MMIX and Friends are now in an svn repository. You can get the sources via svn or browse them directly. Thanks to Anselm Binninger, there is an new free Integrated Development Environment (IDE) for MMIX implemented in Java. Check it out at BWK-Technik. Another IDE is under development (see the bottom of Win32 Executables). Contributions to future editions of "The Art of Computer Programming"
You can send MMIX related material to the email address provided below. We will try to provide you with immediate feedback. Although MMIX versions of all MIX programs in volumes 1--3 of The Art of Computer Programming are now available (see above), we would happily accept (and reward) any improvements you contribute. The ongoing project is documented on the MMIX Supplement pages, hence the content of the MMIXmasters pages are intended mostly for reference. We plan to set up a system to submit bug reports and other material to help us improve MMIX and the software provided here. For now, you can just send an email to the address provided below. The Links page tries to offer a "complete" collection of links to MMIX related web pages. Please help to keep it current. Send me an email if you think there is a link missing or outdated.